These formats serve to introduce message formats the the different switches that are available to message processing. These formats will also be used regularly in subsequent Blog entries. In this Blog entry, an Account Financial Transaction will be explored. The response XML is written out to the Response code editor, formatted as XML. Furthermore the response time is recorded, which is 6 milliseconds in this example, alongside the HTTP response status of 200 (success). 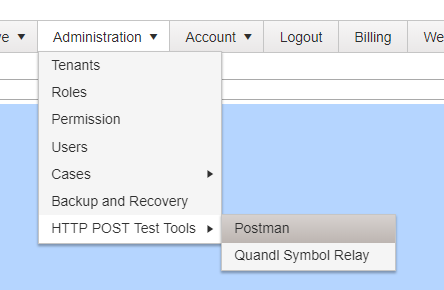 Refresh the page by navigating to Administration >>> HTTP Post Tools >>> Postman then proceed to repeat this process using JSON as follows. The response JSON is written out to the Response code editor, formatted as JSON. It can be seen that Jube is able to accept both XML and JSON over the https://api.jube.io endpoint. The endpoint is described as being promiscuous in this regard and simply expects the the XML or JSON to be valid, and parse on receipt. Make note that the structure of both XML and JSON is comprised of elements which can be referenced using XPath or JSON Path respectively. The Jube Platform does not have a hard-coded API specification and the HTTP Endpoint is promiscuous in the format of the GET or POST body that it accepts, with that POST body being parsed as per a specification configured in each Symbol or Entity model. The POST body may be XML or JSON, in any structure, with its precise structure being configured in the Entity or Symbol model definition of Jube. It of course follows that the XML or JSON should pass a parse on receipt of the POST, appropriate to the specification. When the Jube Engine receives a HTTP request, the POST body is not initially inspected or parsed, instead only the Query String of the HTTP request is inspected for the presence of switching keys. The http SSL designator which is used to encrypt HTTP traffic using SSL. The IP address or sub domain name for which HTTP posts are to be made. The colon designating a nonstandard port to be used, followed by the port. This is not needed, but is included for completeness. The model to be invoked for the purposes of processing the POST body is passed in the query string, everything that follows the ? will be considered model parameters. While there are several parameters available in model recall, such as the ability to process a model asynchronously, for the purposes of this document there is a single parameter of EntityAnalysisModelGUID which, by virtue of its presence, switches to the entity subsystem and will seek a GUID as follows. The GUID of the model, created automatically on model insert. A switch to be made to the Symbol Subsystem to process a new Symbol (e.g. Stock Price). A switch to be made to the Exhaustive Subsystem to recall a trained model, bypassing the Entity Model and Symbol Model processing. A switch to be made to the Entity Subsystem to process a new Entity (e.g. Account Transaction). A switch to be made to process a Tag for a given transaction previously processed through an Entity Model. Although the endpoint for all requests made to Jube is the same, the processing is very different depending upon the switch. The formats document provides examples of messages routed by each switch set out above.